Friends! I am SO excited about this giveaway! 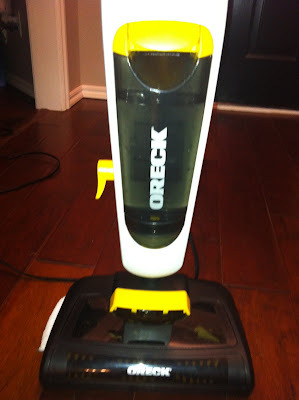 One person reading this blog is going to win your very own Oreck Grab-it & Steam-It Steam Mop! Since having Eli last March I've noticed that cleaning my house has taken a back seat in my life. Well....it's not like it was at the tip top of the list before Eli but now it's sort of at the tip bottom. Bit bottom? It's at the bottom. So when Oreck contacted me and asked if they could send me a Grab-it & Steam-it to review because it would make my cleaning life easier, I was like HECK YES you can!!! And let me tell you, the people at Oreck did not lie. It really has made my cleaning process easier. It has completely eliminated a step for me when it comes to my hard surfaces in our house, and we have a lot of hard surfaces! Between our tiled kitchen and bathrooms and our hardwood in our dining room and entryway, there is always a floor that needs to be cleaned. And always a mama that keeps procrastinating. So you might be wondering, how does the Grab-it and Steam-it eliminate an entire step? Well it is a turbo broom and steam mop all wrapped up in ONE lightweight, cleaning machine! Instead of spending time sweeping and sweeping, cleaning up your piles of what you swept, and then taking the time to mop the floor that you just swept only to find particles that you missed and are now in your mop water and it's all gross and dirty and you are just smearing particles of debris everywhere- you can sweep AND steam in one easy step. For those of you who don't like to read a lot of text I have included a Vlog for your viewing pleasure. Important Details and Rules: This giveaway is open to US RESIDENTS ONLY. You must be 18 years and older to enter. No duplicate comments. There will be one winner of the Oreck Grab-it & Steam-it. This giveaway will run from December 5, 2011 until December 12, 2011. Winner will have 72 hours to get back to me otherwise a new winner will be selected. Please leave a way for me to notify you. Winner will be determined via drawing on random.org. Odds of winning will be dependent upon total number of entries. Disclosure – I was given the Oreck Grab-it & Steam-it to review and keep. All opinions stated in this post are entirely my own opinion. 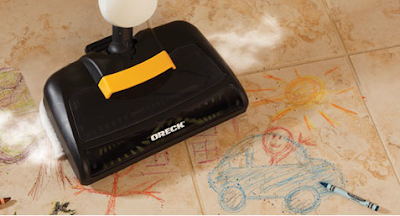 Oreck is providing the Grab-it & Steam-it for the winning entrant. I learned that Oreck has TONS of products! Wow I didn't know how many helpful tools they had! Less than 10 lbs when full of water! I love that it uses water only, no other cleaning chemicals needed. I learned they have easy and convenient payment options. I have now liked on Facebook. I have now tweeted this offer. "Grab-It & Steam-It™ features a large capacity removable water tank for easy filling. It can hold 21 ounces of water that will provide about 30 minutes of steam. Less time refilling means cleaning gets done faster! Variable steam control allows the user to match to steam output to the cleaning task." I follow Oreck on Twitter (I am MommyJennyBlog). I signed up for Oreck's email list. It has 30 minutes worth of steam per session...WOW!! I liked Oreck on Facebook!!!! Wow! Great giveaway! I love that it doesn't use any chemicals- just steam! I learned that it only weighs 9.6 pounds with the water added. This is a great device for an older mother or grandmother, as well as anyone else! I had no clue Oreck made so many hard floor products! I've been thinking only carpet! I learned (and love) that it can vacuum and steam mop at the same time! This would save so much time cleaning up dog hair! Love that it sanitizes, too. LOVE the fact you can vacuum and mop at the same time, I LOATHE my tile and what a pain it is to clean. This would help me SO much! I learned that it can pick up spills as well as debris! I never thought of using a steam mop on my counter tops! Wow, great giveaway! I had no idea you could use this cleaner on low pile carpet! I need this. I learned that Oreck offers free shipping--my kind of company! This seems like a fantastic product and I could definitely use it with our new hardwoods. I learned that you don't have to put any chemicals in the water! Love that! I learned that the machine weighs only 10lbs with a full thing of water..and I love that they offer free shipping! I had liked them on facebook! I already follow Oreck on twitter! I liked Oreck on facebook! No chemicals needed, which in my book is better than my old Swiffer! I learned that the Oreck only uses water, no chemicals and with everything that we are discovering now-a-days, that is music to my ears! I learned how lightweight it is...even once you add the water. I learned that the water tank when full provides 30 minutes of steaming! I learned that it can handle low pile carpet! I learned that it has a low profile swivel head to fit into tight spaces. I have plenty of tight hard to reach spaces in my kitchen and bathrooms, so that would be awesome! 30 minutes of steam cleaning! That will get me through the kitchen and bathroom with no need to refill! I thought that you needed to add a cleaner! But only water! Wow. Umm wow 30 ft cord! That is amazing! Would love to own this! I learned that you can clean with no chemicals! I learned that you can steam clean for 30 minutes! I learned you can use it on carpet/rug/tile/hard-wood! Great giveaway! This would make life so much easier as I have all hardwood and 5 kids! ;) I like how lit it is. Makes it easy for my kids to use! Ha! I learned that it works on low-pile carpet<<< I have that!!!!!! ahhhh soo exciting. Pick ME, Me , MMMEEE PLEASE!!!!!!! What a great giveaway!!!!!! This is exactly what I need... we have huge tiled floors throughout our house, and it is such a pain to sweep or vacuum, and then go back and mop. But we do it. All.The.Time. This would be perfect!!!! This is EXACTLY what I have been looking for. And I think that oreck products are great! What did I learn at the oreck.com page... welll... after spending a lot (!!) of time there, I checked out their steam mops and definitely like the grab-it-and-steam-it the best, since it can vacuum and mop at the same time. I also looked around at their regular vacuum cleaners... I like the upright & handheld vacuums! I also signed up for their email list on their website. I also now follow @oreck on Twitter! I learned that Oreck is super light! I follow @oreck on Twitter!! I "Like" the Oreck page on Facebook. I signed up for Oreck's email list too. I also liked Oreck on FB! It is less than 10 lbs when full of water! I didn't know they made air purifiers. We could really use one of those too! I learned that it works on carpet too!! That would be awesome to have! I/m following them on Twitter. I learned it only weighs 9.6 lbs when full! Easy to cart up and down the stairs! I signed up for Orecks email list. I learned that you can steam for 30 minutes! How exciting! I read that it's easy to get in tight spaces which would be so nice! Also liked them on Facebook.. I love that it can pick up spills! I love that it's so lightweight. Only 9.6 lbs when full of water! Wow so light and washable pads!. Would love to win this! Love that no chemicals are used!! Learned that no chemicals are needed. Who knew? Such a fun giveaway! I learned that it doesn't use any chemicals - only steam! Yay! I learned that it heats up quickly. This is so cool! I learned it's chemical free! Awesome! I neeeeeed this!!! I liked Oreck on FB. And, I signed up for email (great). I learned that you can multi-task while cleaning... mopping and vacuuming all at one time, which cuts out one of my steps! Great! I love that it's all natural - just water! Great for my 16 & 2 month olds! I have NO time to get soap and water ready! Wow, I love that it sweeps AND then mops! No more dragging out the broom then the mop!! I signed up for email at oreck! Works on low pile carpets. Heck yeah! Love that it works on hard surfaces AND carpet! Wow - what I fantastic giveaway! I learned that the Grab-it and Steam-it mop is very lightweight (under 10 lbs when full of water!) - very important to me, as I would be using it on all 3 floors of our home! Signed up for Oreck's email list! This works in carpet too???? That's definitely the coolest thing I learned. Thanks for this giveaway!! I also signed up for their emails. Thanks again! I learned that the grab it and steam it cost the same as the one that only steams. Sounds like it's a good deal! Love it on wood floors! Thanks! The fact that this a steam mop and broom is just awesome! Nothing better than taking care of two things at once! I learned that it is lightweight because it's made with magnesium! I also liked Oreck on Facebook! I found out that it's so light! I learned that it can steam clean for 30 minutes straight! I learned you can use this on carpet as well as hard surface floors! With 3 little ones this would be a huge time saver! I learned that it is so lightweight and uses only water! Wow - never heard of this, but if I don't win, I totally need to buy one! Cool that it only uses water! I follow Oreck (and you) on Twitter! I have liked Oreck on Facebook! Awesome giveaway! I had no idea that Oreck made a wonderful cleaning machine! I learned that for only $180 if I don't win this (fingers crossed) then the Grab-it and Steam-it is going on my list to Santa! And I LOVE that it will work on low-pile carpet too - genius!!! A small personal disclosure, I have always had a strong fondness for the bald Oreck man! I have signed up for their emails! I have liked Oreck on FB! I learned that it works on carpet also!! I didn't know that they had so many products. They all look wonderful, what a fun giveaway! i learned the oreck is extremely light! i need this is my life!! I want this thing so bad! I love that it sanitizes your floor. I know you mentioned this, but I just read the website and I love that it vacuums and mops in one! I didn't know they made stuff like that and am going to have to get one because we just moved into a house with all hardwoods/tile! I just tweeted about the giveaway. I included the link to your blog, hope that's ok! Signed up for their emails!